A political newcomer and centrist, the 31-year-old Hill supports universal health care and counts Massachusetts Sen. Elizabeth Warren among her supporters. In campaign ads, she also highlighted her family’s police and military service. Republican Mike Dunleavy has fended off Democrat Mark Begich to win the Alaska governor’s race. Dunleavy cast himself as tough on crime and supported a full payout of the check Alaskans receive from the state’s oil-wealth fund, the Alaska Permanent Fund. The payout has been limited since 2016 amid a state budget deficit. Tester is the top Democrat on the Senate Veterans’ Affairs Committee. There’s a winner in the race for Connecticut governor, and it’s Democratic businessman Ned Lamont. The 64-year-old cable TV company founder has prevailed over Republican businessman Bob Stefanowski. Lamont’s victory means the seat stays in Democratic hands, with the Democratic incumbent, Dannel Malloy, set to leave office. Lamont has promised to be a “firewall” against the policies of President Donald Trump. He’d run for office before, losing bids for the Senate in 2006 and for governor in 2010. 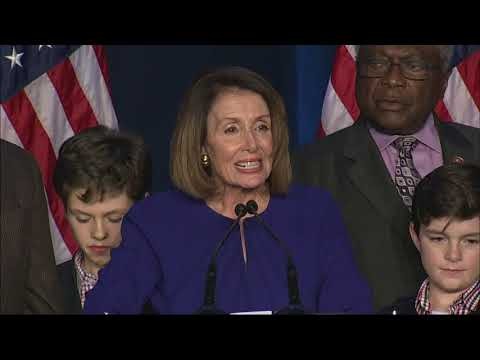 Democrats have regained control of the House from President Donald Trump’s Republican Party in the midterm elections. There was a revolt in the suburbs Tuesday against the GOP, and the political upheaval now threatens what’s left of Trump’s agenda. But on Election Day, Republicans added to their edge in the Senate and prevailed in some key governor’s race. All in all, Republicans beat back the potential of big Democrat gains across the board. The “blue wave” that some feared never fully materialized.